The smartphone has truly revolutionized the way people communicate with each other and it has a great effect on how people also interact with technology. Today, the most prevalent technologies that are on the palm of your hands are Google’s Android and Apple’s iOS. Both the companies are continuously introducing latest features and consumers are reaping the rewards of their endeavors. But the platforms are always compared and contrasted and their features, market shares have a great impact on the adoption rates. Both the platforms in a combined way hold a market share of 98.4% and it is seen that the share is not evenly split between the two platforms. Though both the platforms still dominate the mobile landscape, it is difficult to judge at times, which platform is doing better in the market and is enjoying a stronger position at the moment. A recent survey has stated that the sales of Apple’s iPhone have declined in the past few months and there is now a big difference between the two technologies. 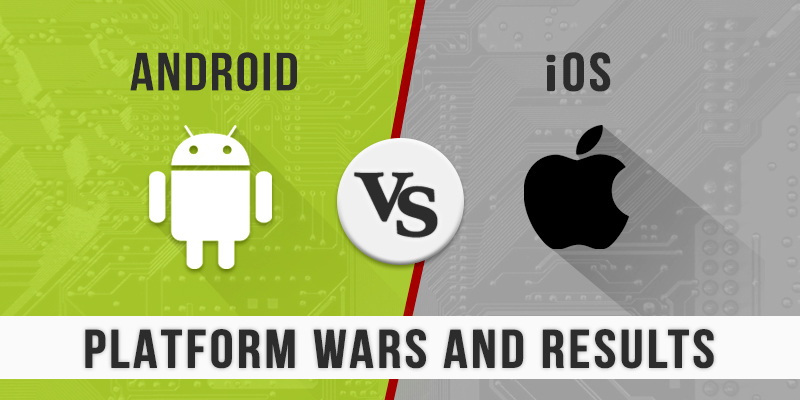 Android development has overshadowed iOS in terms of the user numbers. Today, it seems that Android has become the most preferred choice for markets that include Asia, Europe, Latin America, South Africa and etc. Here in this piece of writing, I will share with you more about the platforms and why it is important to consider them carefully before software development. Those who are using smartphones have a clear idea that there is a great difference in the price range of devices for both the platforms. Android devices are usually lower in cost than the aluminum bodies and ultra-refined iOS devices. Android devices are more cost effective and therefore more appealing to the users. The expensive Apple devices are mostly used by affluent groups of users who enjoy a surplus of income. Apple has always believed that its higher cost is associated with the ultimate user experience that users have of owning the product. The company relied on its tried and tested idea and soon became the best mobile platform of the market. But with technological developments, enhanced features and affordable price range, Android has given Apple a reason to think as it now owns more than two thirds of the market share. Over the last few years, Apple has struggled to hold its market as it slowly started to fall under the Android banner. Apple’s saving grace has been its high user satisfaction rate as its users love the products for its well design, well made and well-engineered products. Latest mobile apps make us want to use a particular smartphone and according to market data there Android users download more apps that are on the Google Play Store than the Apple counterparts through the App store. This is no surprise as the percentage of Android users is more than that of Apple and so they have more downloads. Though Apple has less users, it enjoys higher revenue as more people purchase paid content through Apple’s Appstore. The most interesting fact is that irrespective of the market where both the platforms are present, iOS users still spend more than Android users and mobile app developers still face a dilemma when they have to choose a platform to have a successful mobile app. The battle between the two technology giants will continue as no one holds an upper hand over the other. Apple has enjoyed the power for nearly two decades and is being dethroned by Google’s Android, but it still maintains a strong and loyal base of consumers who are not afraid to invest their money. Both the platforms, Android and Apple are slick, secured and stable with thousands of useful apps available. Though Android is more customizable, iOS is more polished. Compatibility, customization, ecosystem and etc. are the key factors that need to be considered before generating the final results of the war. Drupal Module Development : Custom or Contributed?